Hyatt Place Athens is located in the heart of downtown, within walking distance of all of downtown’s amenities and of the University of Georgia. Directly connected to The Classic Center, northeast Georgia’s premier convention center and performing arts theater, the hotel includes 190 guest rooms, a full restaurant and bar with outdoor terrace dining, an indoor swimming pool, a fitness center, over 3,000 square feet of boardroom and meeting space and a parking deck with over 260 spaces. Through the use of local brick, transitional detailing and bold forms and finishes, the exterior design is both respectful of the architecture of “The Classic City” and forward thinking. Through expansive glass areas and a large outdoor sitting and dining area, the ground floor lobby level engages the street and the pedestrian environment. The floor to ceiling glazing at the second floor conference level energizes the façade and captures dramatic views of North Thomas Street and Hancock Avenue. The top floor Presidential Suite and its balcony cap the building and provide dramatic views of downtown, UGA and Sanford Stadium. The interior provides everything the guests expect from the quality of the Hyatt Place brand. 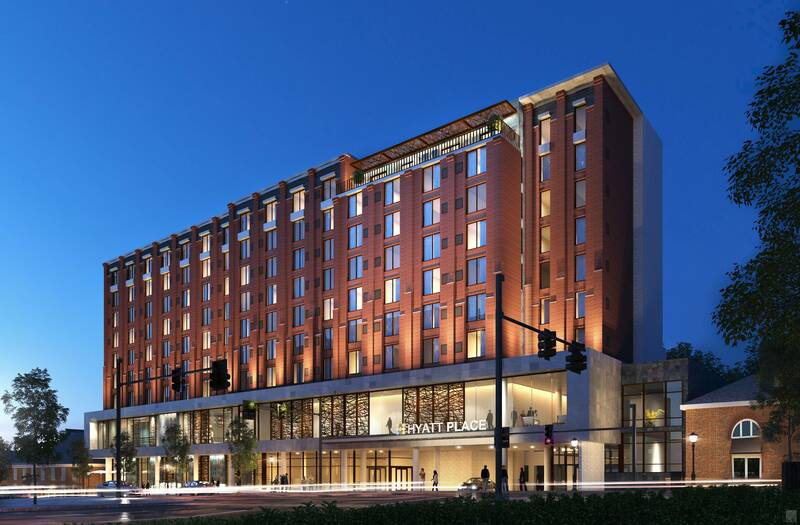 With its design, its location and its amenities, the Hyatt Place Athens sets the new standard for accommodations in Athens.